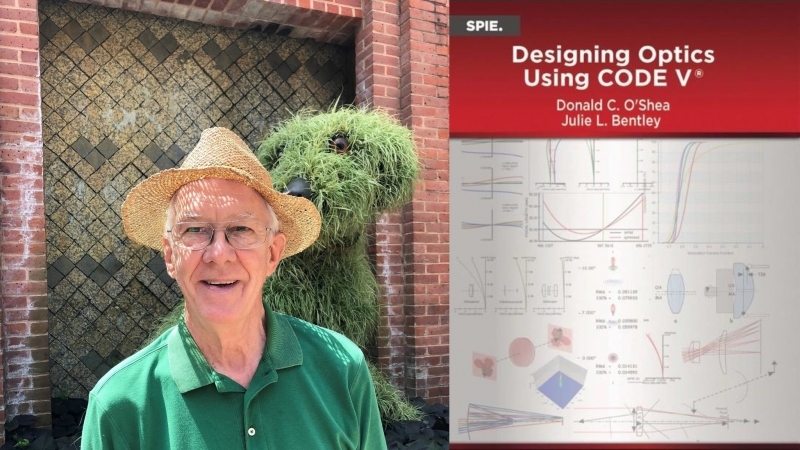 Don O’Shea, Emeritus Professor of Physics, and and Dr. Julie L. Bentley of the Institute of Optics at the University of Rochester have published a text, Designing Optics Using CODE V.
A listing for the text can be found at the SPIE Press Web site. The book was launched at a luncheon at SPIE’s Optics and Photonics conference in San Diego on August 22, 2018. The text demonstrates how to design an optical system using Synopsys CODE V, a full-featured optical design program. The complete design process (from lens definition to the description and evaluation of lens errors on to the improvement of lens performance) is developed and illustrated using the program. This text is not a user’s manual for CODE V. Instead, it begins with a single lens to demonstrate the laws of optics and illustrates the basic optical errors (aberrations). Then, through a series of examples, demonstrations, and exercises, readers can follow each step in the design process to analyze and optimize the system for the lens to perform according to specifications. The text is organized to help readers (1) reproduce each step of the process including the plots for evaluating lens performance and (2) understand its significance in producing a final design.